In the highly competitive beverages market it pays to be one step ahead of the competition. Stand-Up Pouches are the eye-catching packaging with a proven track record for differentiation and strong branding. 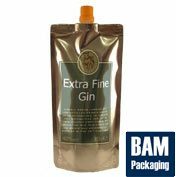 Whether its pure spirits, iced coffee or energy drinks - Stand-Up Pouches are the cutting edge packaging solution which respect the environment and win new customers. > Leichte, Platz sparende Verpackungen sind ideal für Sport, Camping etc.